Bar open Tue–Thu 5pm–1am, Fri/Sat 5pm–3am, Sun 5pm–1am. Closed Mon. Underground bar where gin is king, and that's no bad thing. G.I.Y might not be the word on everyone’s lips down your local B&Q, but give it time. At Heads and Tales, G.I.Y stands for Gin It Yourself, a neat ‘make your own cocktail’ concept that happily over-rides any bafflement at the substantial range of gins atop the back bar. During the day, the space is home to the Edinburgh Gin distillery, whose working stills twinkle prettily from behind the main seating area. 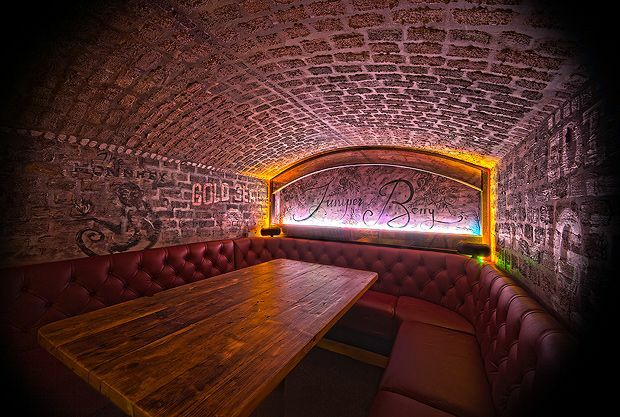 It’s all wrapped up in a quirky subterranean space; just enough prohibition-style touches to not be annoying; and a compact but perfectly acceptable menu of bar nibbles (the mug of fish and chips goes down particularly well). With evening-only opening, a no children policy, a hard to find entrance (keep your eyes peeled for a solitary, lit plaque above a staircase) and lovely, lovely gins, this feels like a forbidden, adult pleasure – in short, like you’ve died and gone to Gin Heaven.